The Middle Danube Basin covers a large area reaching from the Gate of Devin near Bratislava to the impressive gorge of the Danube at the Iron Gate between Serbia and Romania. Confined by a string of mountains, from the Carpathian Mountains in the north and east to the Julian Alps and the Dinaric Mountains in the west and south, the basin contains a number of outstanding wetland areas. 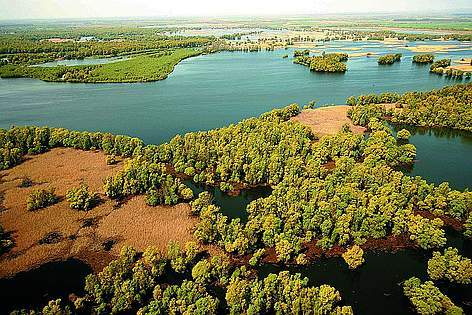 The Gemenc-Beda-Karapancsa wetlands (Hungary) represent an exceptional example of a larger old floodplain with big meanders, oxbow lakes, marshland and extended hardwood forests, which are especially important for rare bird species, including Black Stork and Sea Eagle and an important fish-spawning ground. Kopacki Rit (in Croatia), a 30,000 ha wetland area wedged between the Drava and the Danube, is one of the richest and most dynamic floodplains of the Danube River Basin. The area, which has extended floodplain forests (willow, poplar and oak), floodplain lakes, ponds, extensive reed beds and marshes, has been designated as a Ramsar Site and Nature Park (IUCN category Ib and V). It has also been proposed as part of a trans-boundary Biosphere Reserve along the Drava and Mur rivers. 100 days flooding per year and the abundance of food and underwater vegetation makes Kopacki Rit, after the Danube Delta, the most important fish-spawning ground along the entire Danube. Just opposite Kopacki Rit lies the wetland complex of Gornje Podunavlje (Serbia and Montenegro) with 19,648 ha of floodplain habitats. This spatially and ecologically unique complex with its mosaic of water, marsh, swamp, meadows, bush and forest ecosystems, is characterized by a high biodiversity and significant number of threatened, rare, endemic and relict species. A special case are the middle and lower Drava-Mura wetlands (Slovenia, Croatia, Hungary) forming an intact bio- and landscape corridor of 380 km from the alpine foothills up to the Pannonian Lowlands on the Danube. The floodplain covers 60,000 ha and forms a unique living space especially for migratory freshwater species and alpine pioneer species living on sand, gravel bars and islands as well as for forest species and mammals such as river otter and beaver. The Tisza River basin - with a surface area of 157,220 km2 - is one of the largest in Europe and includes five countries. Rising in the Carpathian Mountains, and having a total length of 966 km, it forms a direct ecological connection between Central and Eastern Europe’s principal Global 200 ecoregions – the Carpathian Mountains and the Danube river floodplains. Stay informed with WWF Danube-Carpathian's monthly newsletter.